The Akileine Red range of foot crèmes and balms are formulated to decongest and soothe tired, swollen feet inflamed by walking, heat or tight shoes. They provide a pleasant sensation, freshness and enhance blood circulation. is formulated specially for Hot feet, tired and heavy legs with Ginkgo Biloba for hot feet, tired and heavy legs. Applying this refreshing gel on tired feet and legs when needed will instantly bring an intense and long lasting relief. As you apply it you will feel its cooling effect immediately. The gingko biloba and Horse-Chestnut tincture decongest and activate your micro-circulation. The Gel is easy to apply and is not greasy, does not stain and is not sticky. Instantaneous action the spray is from the first application, the feet are pleasantly refreshed. The Melilot activates the micro-circulation. The extract of liquorice alleviates the plantar feeling of heating. The freshness effect is felt even through stockings. Does not stain and is non sticky. Please note that aerosols are no longer shipped overseas due to new international laws. Therefore this item cannot be sent outside the UK. 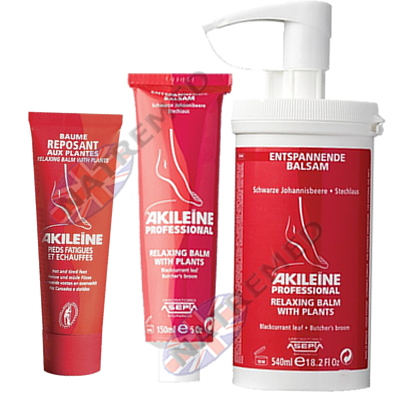 I recently purchased some Akileine Intense Freshness spray from your company, on the advice of the foot professional at my doctor's practice who had a sample bottle in her possession. I have been suffering acute discomfort at night from burning and restless feet, which I understand is related to the surgery on my spine for sciatic nerve problems. 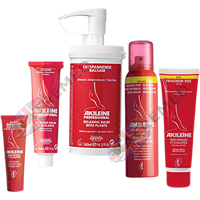 I have used the Akileine spray every night for the past 2 months, and have enjoyed undisturbed sleep all that time. The spray has certainly worked for me and I can recommend it without reservation. Thank you once again. You have my permission if you wish to use this testimonial in any way. iFormulated for Hot, Tired, Swollen Feet and Legs, and provides a long lasting therapeutic Treatment. If you suffer from tired, swollen, irritated feet, which are sensitive to heat, or from walking and standing over long periods of time. Let this relaxing balm soothe away those aches and pains. The plant extracts used provide an instant sensation of well being and comfort. The balm Detoxifies, Restores skin’s pH, Decongest's (When feet and legs swell it is due to water retention), Relieves tension, Soreness and Pain and enhances blood flow. The natural moisture balance of the skin is maintained and protected from physical and organic chemical aggressive agents. Also eliminates foot odour, is easy and quick to apply and is non-greasy.